Often my children remind me just how greatly and simply they understand the principles of the Lord. They are a constant reflection of Christ’s words in Matthew 18:3 – “Unless you become like little children, you will never enter the kingdom of heaven”. At 8 & 6 years old, my kids just “get it”. On the way to church Sunday, my son announced that he was bringing all his money to donate to Jason (an orphan boy the Sunday School classrooms support each year). He’d gathered every dollar in his possession and had his treasure clutched between his tiny fingers, ready to give it all away to a child he’s never met. Instantly, his generous spirit laid bare an overarching principle that I still struggle with well into my 30s. “Ours” is really God’s. He doesn’t need our stuff…but wants to bless our lives through giving. You see, my son completely trusts that all his needs are being met by his parents. Being miserly and selfish about his money isn’t necessary, because he is content with what is provided for him at home. We are a one income family and do our best not to spoil our kids. As Americans, we are rich beyond measure, but we are Dave Ramsey baby-step followers and as such, are savers rather than spenders (in general). However, there’s always three meals on the table, clothes to wear and beds to sleep in, and because of his faith that he doesn’t “need” things, my son was released into the freedom of generosity. 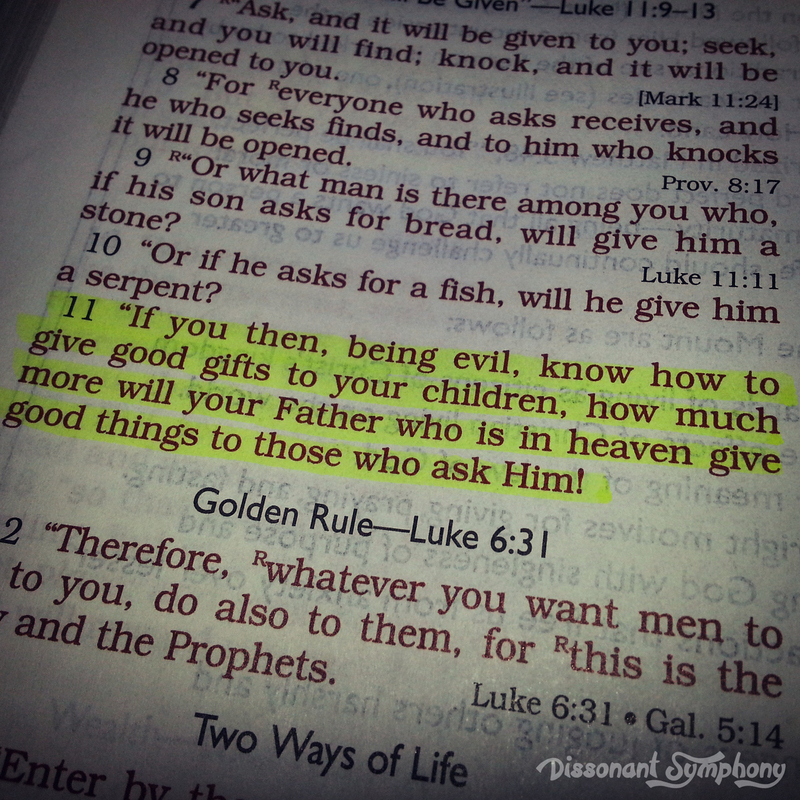 Our heavenly Father is beyond more equipped than I am as a parent to bestow charitably to His children. 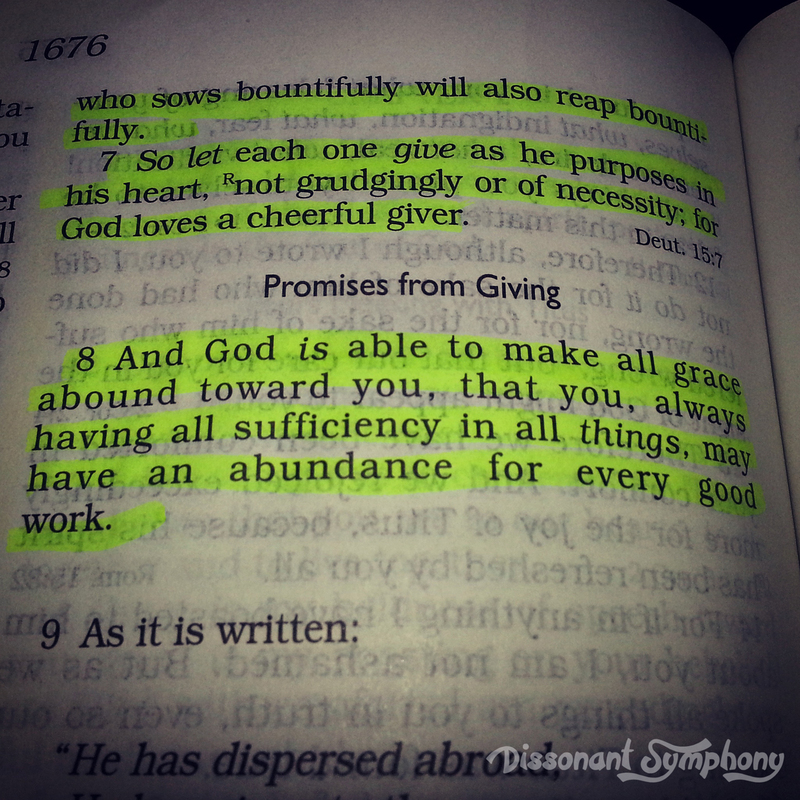 Therefore, as precious ones of God, we are to give cheerfully, fully, unabashedly. Recognizing that the Lord of all creation, in whom all things are held together, will supply all our needs. This lesson a huge stumbling block in my life. I’m innately possessive over all God’s gifts. The unique way I’m wired, my talents, income, my children. My natural inclination is to hold tightly to these things, to maintain my grasp so they cannot be lost, used, mistreated or taken advantage of. God’s word is plain on this issue. He is constantly weaving His direction into the fabric of my life, both in the commandment to give, and the promise of the Lord’s faithfulness. 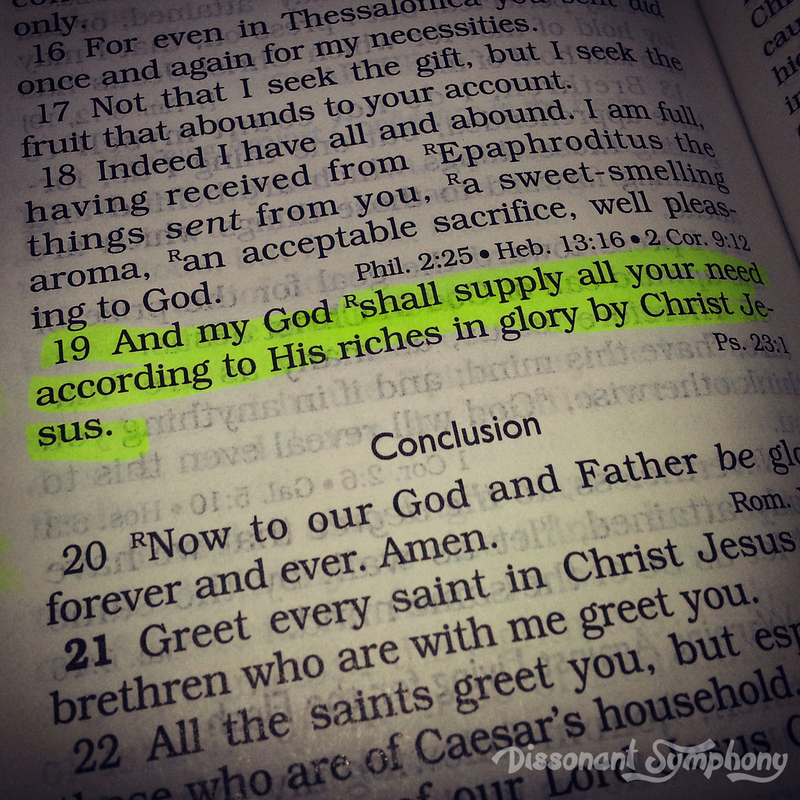 The encouragement that He is able to make all grace about towards us. That we would have sufficiency in all things and an abundance for every good work. I’m not just talking about financial sufficiency here. I’ve experienced tremendous emotional and spiritual valleys in my life. Times I felt completely ill-equipped to offer anything to anyone ever. During these trials and barren years, God was dumping an abundance of His spirit into my soul. I spoke to a WWII vet over Memorial Day who put it best (regarding the war) “I wouldn’t take a million dollars for the experience, but you couldn’t pay me enough to do it again.”. Likewise, I wouldn’t trade the lessons in empathy, grace and trust I received during the hardest times in my life for anything, but there’s no treasure on earth that would make me want to relive those times. What God taught me through my son’s open-handed giving is that I should trust my Father exponentially more than my sweet boy believes in me. If, in my limited resources, I want to provide for my family, how much more does God want to pour into our lives? He has the bounty of the universe at His disposal and wants to give a good measure, pressed down, shaken together, and running over into our lives. I want to relinquish control of all I pretend to possess. To offer it up with the faith of a child, secure in the knowledge that I’m taken care of and loved beyond any measure. I want to give it all to the One who gave it all for me.